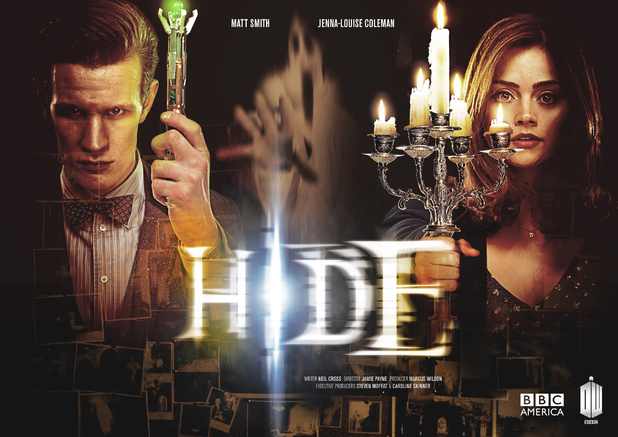 It takes a brave writer to set an episode of Doctor Who in a haunted house after the magnificence of series three’s “Blink” (a favourite of even the most ardent Whovians), but Neil Cross’s “Hide” was an absolute corker. Set in 1974 in eerie Caliburn House, psychic Emma Grayling (Jessica Raine) and war hero turned ghosthunter Alec Palmer (Dougray Scott) are attempting to make contact with “The Witch of the Well”, a ghost that has tormented the house’s inhabitants for hundreds of years. Enter the sprightly Doctor (Matt Smith) and plucky new companion Clara (Jenna Louise Coleman) on a ghost-busting mission with a delicious sci-fi twist. A tour of the house sees the Doctor and Clara walk through strange pockets of icy air, secretly stalked by a truly horrible blink-and-you’ll-miss-it melty-faced monster. The Doctor soon discovers the “Witch” is not a ghost (of course it’s not, this is Doctor Who) but is, in fact, Hila, a time-travelling pioneer from Earth’s future trapped in a pocket universe which runs through Caliburn House. Within this pocket, time runs grindingly slow. A second to Hila is 100,000 years to everyone else, hence why her brief scream has demented the house’s inhabitants for centuries. What’s more, she’s running from something: the monster lurking in the house’s shadows. “We’ll need some sturdy rope, a crystal from Metebelis 3, and some Kendall mint cake,” says the Doctor, skipping off to dig something out of the TARDIS. There are all sorts of incredible moments in “Hide”: Clara moved to tears as she watches the life cycle of Earth from birth to death; Emma warning Clara of the “sliver of ice” that resides in the Doctor’s heart; the TARDIS continuing to hate on Clara; the Doctor telling “impossible girl” Clara she is “the only mystery worth solving”; Alec and Emma’s tormented romance; Alec telling the Doctor “I have killed. And I caused to have killed. I sent young men and women to their deaths and here I am, still alive. It does tend to haunt you”, a line that could so easily have come from the Doctor’s mouth. And why didn’t the Doctor know where to hang Clara’s umbrella inside the TARDIS? In a series full of references to memory (“Run, you clever boy; and remember”) that certainly felt like one of those seemingly-silly-but-actually-deeply-significant Doctor Who moments, just one such moment in an episode that could well become a classic.